What was in my Seedy Penpal Parcel? Earlier this week the postlady delivered a package from my Seedy Penpal Karen. I was eager to discover what goodies it contained, and I was not disappointed. So very soon the seeds below will be growing in my greenhouse. I have never grown Gherkins, Swiss Chard or Mange Tout, so it will be interesting to see the success I have with them. Unlike most gardeners I have never been swamped with a supply of Courgettes, so I am hoping for an ample harvest this year. 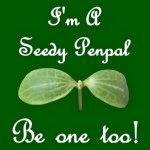 Thank you Karen and happy sowing and growing to all my fellow #SeedyPenpals. I grew some last year next to my cucumber. You received some good seeds. Like you I have never been over run with courgettes. I always feel I am doing something wrong. I think it maybe because my plants always get mildew, so will do my best to combat it this year. Packing away Christmas, well almost.